description-1 = The PC-9/A has been used for pilot training in the ADF since 1989, with trainees undertaking 130 hours of flight training in their Basic Flying Training Course and Advanced Flying Training Course. The aircraft have been phased out for training, with the Pilatus PC-21 taking that responsibility as part of the AIR 5428 Pilot Training System project. description-2 = The Hawk 127 helps qualified RAAF pilots prepare for conversion to F/A-18, F/A-18B Hornets and F/A-18F Super Hornets. Pilots complete a 14-week “introductory fighter course” at RAAF Base Pearce with the Hawk, which includes general flying, instrument flying, formation flying, night flying and navigation. description-3 = Hailed by the RAAF as the “world’s most advanced pilot training aircraft”, the PC-21 is replacing the current fleet of PC-9A as the primary plane used by the ADF for training purposes. It will be based at RAAF Base East Sale in Victoria and RAAF Base Pearce in Western Australia. description-4 = The F/A-18B Hornet is a multi-role fighter aircraft that is capable of air-to-air and air-to-ground missions. In recent years, the Hornets have participated in a number of training exercises, including Exercise Bersama Lima and Exercise Bersama Shield in Malaysia, Exercise Red Flag in Alaska, and Exercise Pitch Black in the Northern Territory. description-5 = The PC-21 is equipped with a pressurised cockpit, air conditioning, anti-g system and on-board oxygen generation. The aircraft is capable of sustained low-level speeds over 320 knots, with a max-speed of 370 knots (685km/h). description-6 = Manufactured by BAE Systems, the Hawk 127 allows pilots to pre-program mission-specific data into the 1553 multiplex database. The pilot is also displayed a Health and Usage Monitoring System that monitors and records equipment performance, aircraft fatigue and engine life information. description-7 = The Hawk is fitted with practice AIM-9M Infrared Missiles, conventional and laser guided bomb and a 30mm cannon to help pilots prepare for conversion to fighter jets. The aircraft has a top speed of 1,207km/h and a range of 2,520km. description-8 = The PC-9/A is stationed at RAAF Base East Sale and Williamtown, with East Sale using the aircraft to teach qualified RAAF pilots become flying instructors. RAAF Base Williamtown has four modified PC-9/A aircraft in grey paintwork that are fitted with smoke grenade dispensers for target marking. They are used to train ADF Joint Terminal Attack Controllers in co-ordinating air support to troops on the ground. description-9 = The Hornet was originally developed for the US Navy and Marine Corps and, as well as Australia, has been used by Canada, Finland, Kuwait, Malaysia, Spain and Switzerland. The aircraft has a ferrying range of 2,700km without needing to refuel, an interdiction range of over 1,000km, and a combat radius of 740km. The F/A-18B has a top speed of Mach 1.8 (2,200km/h). description-10 = The Pilatus PC-9 is used by 12 different nations around the world, including Ireland, Switzerland, Thailand, Croatia and Mexico. The Australian variant, PC-9A, first production aircraft flew on 19 May 1987.
description-11 = The PC-21 is based at RAAF Base East Sale in Victoria and boasts a number of features that help to simulate Australia's fighter jet fleet, including hydraulically assisted ailerons and roll spoilers that can reproduce fighter-like rates of roll in excess of 200 degrees per second. description-12 = RAAF has operated the Hornet since 1984, purchasing 75 A and B variants three years prior to that to replace their fleet of Dassault Mirage III fighters. The Hornets are due to be replaced by the F-35 Lightning II fighters, with Canada lined up to purchase 25 ex-Australian Hornets in a $90 million deal. 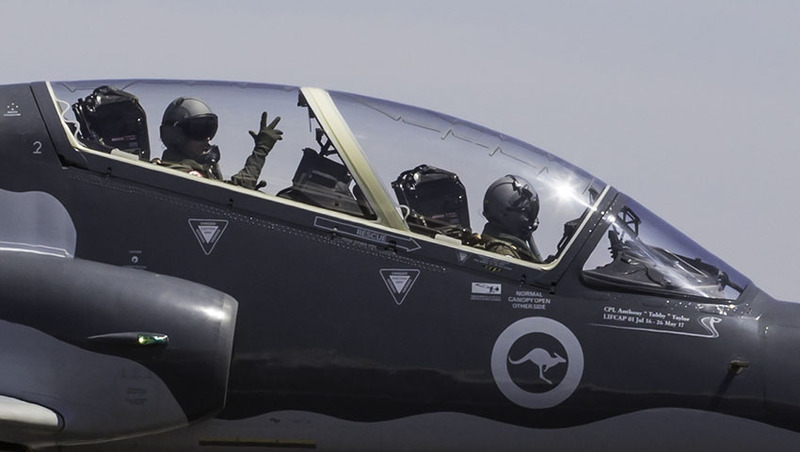 The Royal Australian Air Force was able to show off 15 different aircraft in its fleet at the Avalon Airshow, including four different planes used for training pilots of every experience level. The PC-21, PC-9A, Hawk 127 and F/A-18A-B Hornets were all on display at Avalon, with onlookers treated to an in-depth look at the aircraft used by the Air Force to prepare its pilots for a number of capabilities. It wasn't just training capabilities on show though, with the RAAF demonstrating the next-generation of Australian and allied air combat capability, including the F-35 Lightning II Joint Strike Fighter. The trade show days also provided an opportunity for the US, Japan and other allies to demonstrate their air fleets ranging from the KC-135 Stratotanker and B-52H Stratofortress to the next-generation F-22 Raptor and Kawasaki C-2 tactical transport aircraft. It was also a chance for industry to reveal their own capabilities and demonstrations, including Boeing Defence, which in partnership with the Defence Science and Technology Group (DSTG) revealed a world-leading 'loyal wing man' unmanned aerial system concept, which will support Australia's future manned air combat systems. The PC-9/A has been used for pilot training in the ADF since 1989, with trainees undertaking 130 hours of flight training in their Basic Flying Training Course and Advanced Flying Training Course. The aircraft have been phased out for training, with the Pilatus PC-21 taking that responsibility as part of the AIR 5428 Pilot Training System project. The Hawk 127 helps qualified RAAF pilots prepare for conversion to F/A-18, F/A-18B Hornets and F/A-18F Super Hornets. Pilots complete a 14-week “introductory fighter course” at RAAF Base Pearce with the Hawk, which includes general flying, instrument flying, formation flying, night flying and navigation. Hailed by the RAAF as the “world’s most advanced pilot training aircraft”, the PC-21 is replacing the current fleet of PC-9A as the primary plane used by the ADF for training purposes. It will be based at RAAF Base East Sale in Victoria and RAAF Base Pearce in Western Australia. The F/A-18B Hornet is a multi-role fighter aircraft that is capable of air-to-air and air-to-ground missions. In recent years, the Hornets have participated in a number of training exercises, including Exercise Bersama Lima and Exercise Bersama Shield in Malaysia, Exercise Red Flag in Alaska, and Exercise Pitch Black in the Northern Territory. The PC-21 is equipped with a pressurised cockpit, air conditioning, anti-g system and on-board oxygen generation. The aircraft is capable of sustained low-level speeds over 320 knots, with a max-speed of 370 knots (685km/h). Manufactured by BAE Systems, the Hawk 127 allows pilots to pre-program mission-specific data into the 1553 multiplex database. The pilot is also displayed a Health and Usage Monitoring System that monitors and records equipment performance, aircraft fatigue and engine life information. The Hawk is fitted with practice AIM-9M Infrared Missiles, conventional and laser guided bomb and a 30mm cannon to help pilots prepare for conversion to fighter jets. The aircraft has a top speed of 1,207km/h and a range of 2,520km. The PC-9/A is stationed at RAAF Base East Sale and Williamtown, with East Sale using the aircraft to teach qualified RAAF pilots become flying instructors. RAAF Base Williamtown has four modified PC-9/A aircraft in grey paintwork that are fitted with smoke grenade dispensers for target marking. They are used to train ADF Joint Terminal Attack Controllers in co-ordinating air support to troops on the ground. The Hornet was originally developed for the US Navy and Marine Corps and, as well as Australia, has been used by Canada, Finland, Kuwait, Malaysia, Spain and Switzerland. The aircraft has a ferrying range of 2,700km without needing to refuel, an interdiction range of over 1,000km, and a combat radius of 740km. The F/A-18B has a top speed of Mach 1.8 (2,200km/h). The Pilatus PC-9 is used by 12 different nations around the world, including Ireland, Switzerland, Thailand, Croatia and Mexico. The Australian variant, PC-9A, first production aircraft flew on 19 May 1987. The PC-21 is based at RAAF Base East Sale in Victoria and boasts a number of features that help to simulate Australia's fighter jet fleet, including hydraulically assisted ailerons and roll spoilers that can reproduce fighter-like rates of roll in excess of 200 degrees per second. RAAF has operated the Hornet since 1984, purchasing 75 A and B variants three years prior to that to replace their fleet of Dassault Mirage III fighters. The Hornets are due to be replaced by the F-35 Lightning II fighters, with Canada lined up to purchase 25 ex-Australian Hornets in a $90 million deal.